Wearing gloves while you're riding has numerous benefits like reducing the vibrations from the handlebar, increasing grip, and protecting your hands from overgrowth. The Troy Lee Designs XC Starburst Gloves are full-finger gloves that are made from a combination of stretch spandex and Airprene. The palm has a dual layer perforated Clarino-i synthetic leather palm and the top has sonic-welded TPR graphics and a velcro wrist closure. I was worried about the size chart for these; you never know how accurate the chart will be. This one is very believable. Take your measurement and order the gloves with confidence. Oh, and the thumb has a cute starry smiley face on it! Great glove with minimal padding. Protects my paws and more importantly they Mach my helmet. These are my second pair. Nothing wrong with the first. They fit me fine. Stand up to hard wear and frequent washing.. Felt a touch snug at first, but stretched nicely and fit great now. Rode with these gloves last week. The fit is spot on. These will be great gloves for cooler weather. The palm is a heavier material and seems to be durable. I chose the white color that has already started its transition to to brown. great fitting gloves. works great all the time. I've always used TLD gloves and they've never disappointed me. The gloves are great. Used the sizing guide provided and my gloves fit perfect. Only comment is that they are very white, so will get dirty quick. Even with lots of dirt and mud, they look just fine. Also can wash pretty well. Great price for solid gloves. Perfect fit and light glove for trail control even when wet! 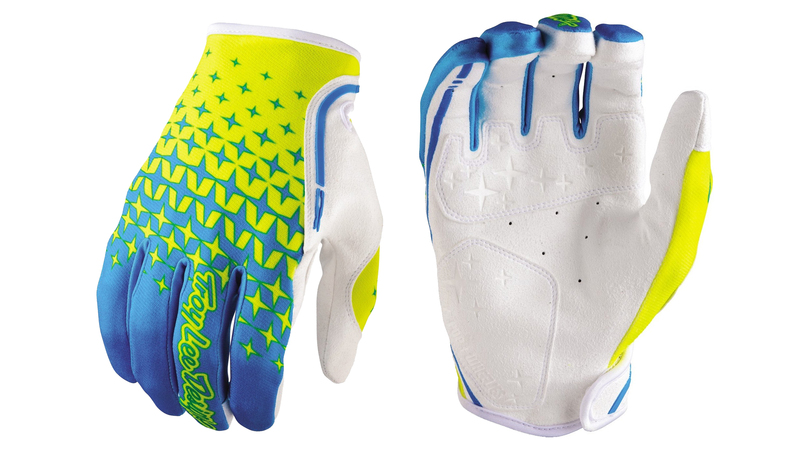 These gloves fit great, look great, and provide a great grip. Check the sizing and measure your hands before ordering. My last pair of gloves were XXL, but the Troy Lee Designs XL fits perfectly. Great gloves for my application. I destroyed both thumbs park riding so I wear a brace on both hands and having a glove without all the added padding on the back of the hand is perfect. Extra material in the palm where needed. Good fitting, comfortable gloves. Have gone down once or twice and the glove held up! good price for this glove! I normally wear an XL glove but this XL left extra length in the fingers. I'm not sure if that means these run true to size or all the others are small. These held up to a season of riding that was mostly wet and humid. No problems with seams separating or tears. Only problem is these held a stink that no amount of washing or soaking in baking soda would fix. Tossed them at the end of the season when I normally can get two seasons out of a set of gloves. I'm a fan of thin palm gloves, so these feel a bit thick with the double layer in a couple spots. Otherwise, great gloves. Cool gloves for the price a little tight maybe snug fit. It's a great fit. It's comfortable. However, they are not so resistant. The tissue is already stretched for 1 glove. Gloves don't fit my hands even so the size they are. Don't like the overall feel and fitting. Disappointed. OK for on-road use, bad for off-road. 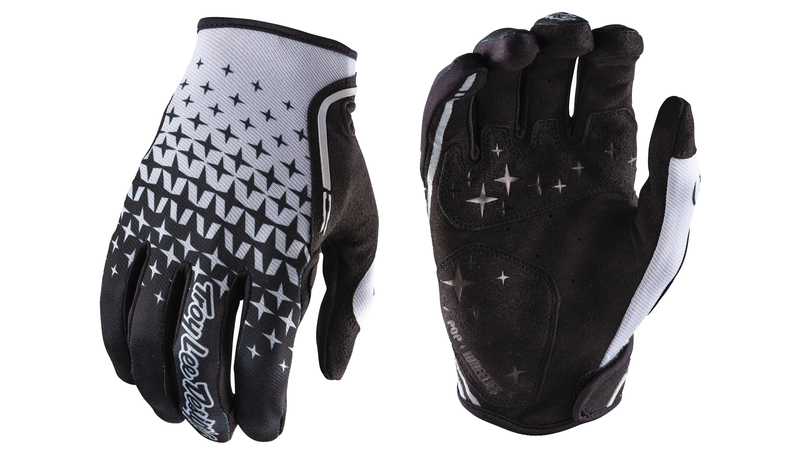 I've heard good things about Troy Lee apparel so I was expecting good things from these gloves. Unfortunately, they're the worst performing gloves I've owned. 1ST, the material on the top seems fragile. I had a run in the fabric of the thumb on day 1. The fabric also gets torn apart by just coming in contact with the velcro on the wrist. 2ND, the stitching of the fingers on one hand is crooked. 3RD, my hands suffer from vibrations in these gloves. I have another similar pair of thin Giro gloves, but my hands are fine in those. For some reason these Troy Lee gloves just transmit more vibration. The fit is good though. I'll be using these strictly as roadie gloves because they just don't cut it out on the trails.